Tastemakers Ask A Chef: What Do You Snack On? Ask A Chef: What Do You Snack On? 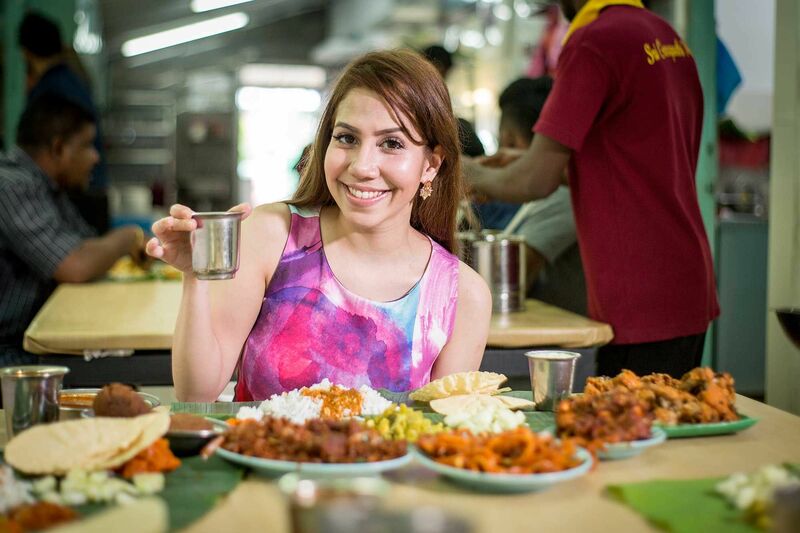 We have banana leaf rice with celebrity TV chef Anis Nabilah at the legendary Sri Ganapathi Mess, talking about her ambitions, her love of sourdough bread, why she’s an egg snob and much more. While she admits that cooking wasn’t the first thing to come to her mind when she was deciding what to study in university, Anis Nabilah’s inherent cooking prowess was one that was nurtured by her mother. In the present, the charming chef is working on the fourth season of her TV show – 1, 2, Bakar! – offering recipes and tips to viewers, even getting the chance to explore the ingredients near and dear to her heart with certain food brands that she grew up believing in. Fun, bubbly and never one to shy away when it comes to food discussions, I first met Anis when we were both selected as judges on a friendly iron chef-styled cooking competition between two fantastic restaurants – Babe and Kikubari. We sat next to each other and loved talking about food so much that we decided to meet up for local food soon after. Sensing that she would be a perfect addition to Ask A Chef, I invited Anis to be the star of our next entry into the series. She said yes, decided on banana leaf rice, and the rest is history. “Food to me is more than something you consume, it’s life. Anywhere I go in the world, when I speak to people and they ask me what I do and I tell them that I’m a chef, there’s this instant connection between us because anyone can connect with food,” she says. Why Did You Chose To Come To Sri Ganapathi Mess? “This is actually my first time coming here. I’m a big banana leaf rice fan and I heard that Sri Ganapathi Mess is one of the best restaurants for this in Malaysia. What makes this place so special is what they put in their curries and their rasam, especially their crab rasam,” explains Anis. What Do You Like To Eat At Home? What’s On The Menu? “I love cooking for people and when I have some time off, I’ll make sure that I cook something special for the people I love. But, when it comes to myself, it’s just really basic. I love eggs and cooking them in all sorts of ways,” she reveals. “I…am an egg snob, haha. I love it because it’s very versatile and it has a very rich flavour if you cook it right,” she adds. Tell Us Something That You Must Have In Your Pantry. “My house hasn’t run out of bread ever since I moved in for over a year now. I love sourdough bread and I make my own when I can but otherwise I buy it from a few good bakeries that I know. If I can’t finish it in time I’ll freeze it and whenever I feel like having a quick meal or a light snack I’ll have a simple dish like grilled cheese,” says Anis. What Do You Hope To Achieve As A Chef? “Because I’m a chef on TV, my job is to teach and share knowledge. But what I hope to do is to share the beauty of Malaysian food to the world. That’s one of my biggest dreams,” Anis reveals with a smile. “I also want to teach the younger generation that cooking good, healthy, wholesome food is doable and that you don’t have to make it complicated,” she adds. “A few people have asked me this. To me, your last meal shouldn’t just be something that you like having or that it just tastes delicious, it should have a story behind because it needs to be sentimental. It would probably be my mom’s cooking, either her beef rendang, her fish curry or even her nasi kandar. It could even be all of that,” she says laughing. Tastemakers Ask A Chef: What's A Telltale Sign That A Restaurant Has Heart? Tastemakers Ask A Chef: What Is Modern Malaysian Food?